Omega has just re-released it however in collaboration with esteemed watch site Hodinkee on the occasion of its 10th anniversary. The 39.70mm Hodinkee 10th Anniversary Omega Speedmaster Chronograph, limited to just 500 examples with all pieces being sold exclusively through Hodinkee.com and in U.S. Omega boutiques for $6,500 apiece, reportedly sold out quickly. The original inspiration, itself a tribute to the great racing driver Michael Schumacher, was chosen because Hodinkee founder Ben Clymer cites it as the watch that first got him interested in horology after receiving it as a gift from his grandfather. 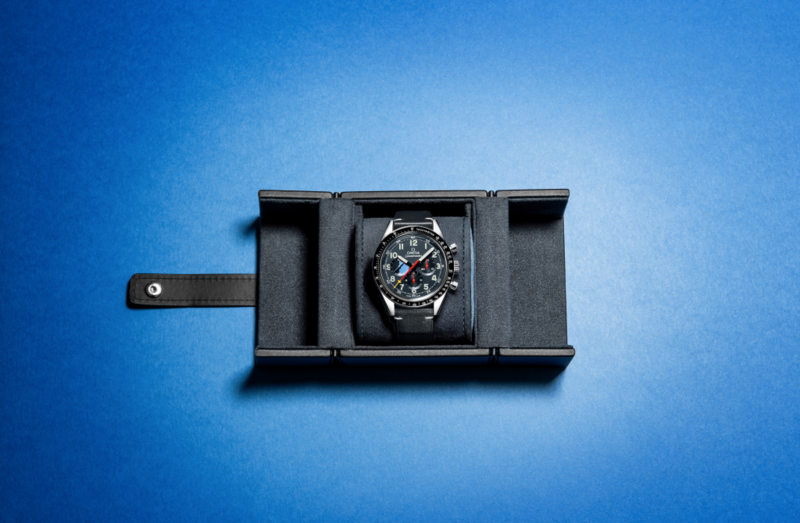 Originally launched in 1995, the Omega Speedmaster MK40 Schumacher Chronograph Triple Date / Day-Date, 375.0084 / 175.0084, is one of the most unique versions of the iconic Speedy ever produced. 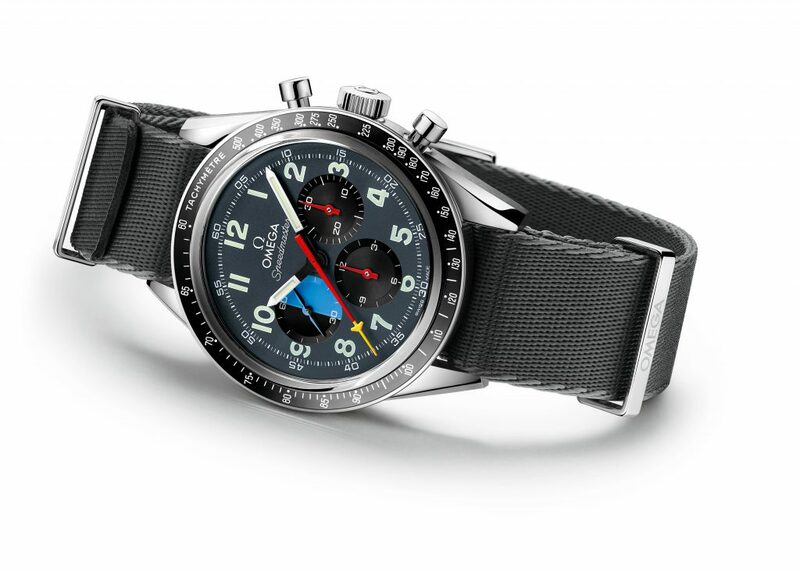 Omega points out that the special edition Hodinkee watch is not an exact recreation of the MK40 Schumacher, noting, “while the triple calendar complication is no longer featured, there are many other familiar touches that recall the original design.” For example, the grey/blue dial includes a minute track as well as luminous Arabic numerals, while the black and blue subdial at 9 o’clock, originally a day/night indicator, has been reimagined as a function indicator with a propeller-shaped hand. It also has black and white hour/minute hands and a red varnished central seconds hand with a yellow airplane tip per the original. Overall it’s a subtle but marked improvement. The watch comes on a grey/blue leather strap, and is delivered in a wooden presentation box with an extra nylon NATO strap and a spring bar tool. 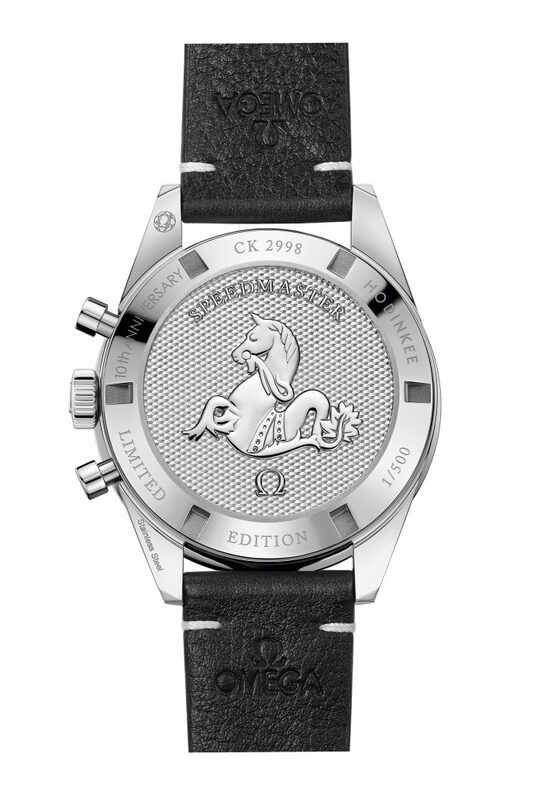 On the caseback, OMEGA has engraved its famed Seahorse medallion as well as the serial number and “Hodinkee 10th Anniversary Limited Edition.” The movement in this case is OMEGA Calibre 1861 which is certainly an upgrade from the original as it’s the Speedmaster Professional Moonwatch caliber.